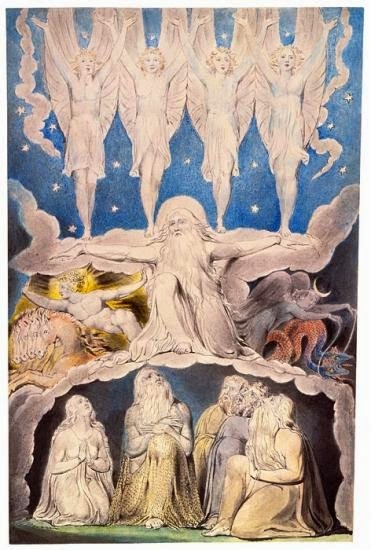 This post is based on a talk I gave at the Ashmolean Museum in Oxford on January 30 2105, about how my books are inspired by mythology, and by William Blake. 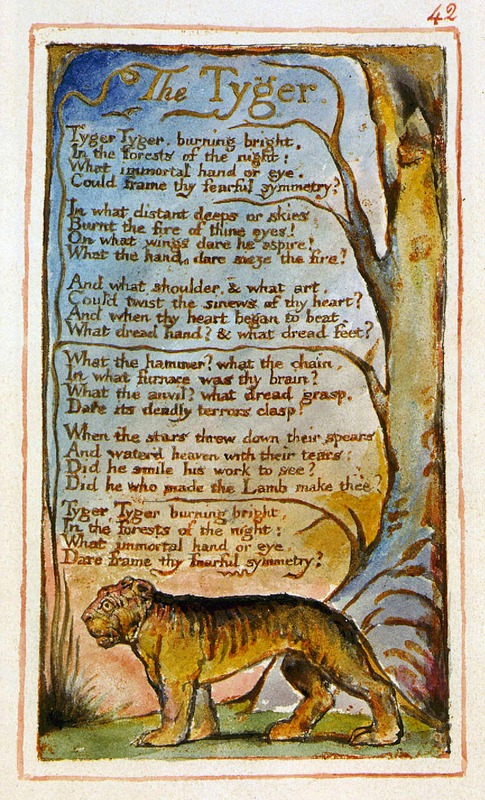 My first encounter with Blake was his poem The Tyger, which I remember studying when I was at school. This poem just blew my mind. It seemed so exciting, mysterious, epic – full of huge, evocative images. Also, it's about a tiger, and I really like tigers! And it seemed mythic to me, and if there's one thing I've always loved, it's mythology. Back then, I had no idea that Blake had created an entire mythology of his own, because the poems in which he did it are not nearly as well known as The Tyger. But I took in all the mythology I could get. I remember at school, we had a teacher who would stop everything on a Friday afternoon, and read us Greek and Roman myths. Amazing stories about gods and goddesses, heroes, heroines and monsters – and I found these absolutely thrilling. 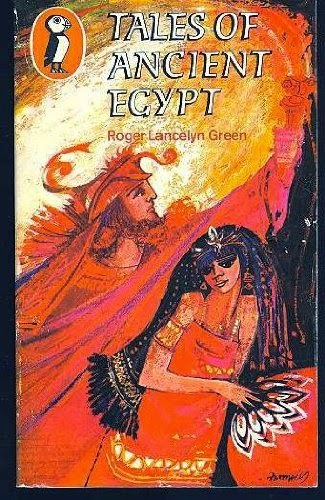 I went away and read retellings of myths, like the Puffin Classics written by Roger Lancelyn Green. Not just Greek and Roman myths, but Norse, Egyptian, and Mesopotamian myths… As someone whose family came originally from the Middle East, I was delighted to find that the very oldest written stories we have came from that part of the world. So they were hugely important to me. I was also very interested in modern writers who used myths in their books. 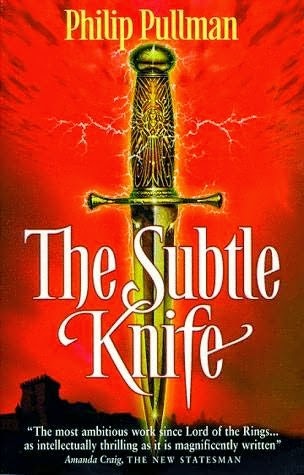 Writers like Susan Cooper and Alan Garner, who in books like The Dark Is Rising and The Owl Service took ancient British myths and folktales and brought them into the modern world. Writers like Ursula LeGuin, who invented all kinds of amazing myths in the Earthsea books. Later on, I loved the way Neil Gaiman used mythology in The Sandman comics; and what Philip Pullman did with it in His Dark Materials. These were all great examples of the kinds of stories I wanted to write myself: stories that were truly mythic. Because I love the idea that myths might be true in some deep way; that they might express something timeless about the eternal questions of our lives: Who are we? Where do we come from? Where do we go? What does it all mean? How should we live? Varjak grows up as a kitten hearing these legends, and wishes he could have adventures like that. Before he knows it, he has to leave home on his own to save his family; he goes out into a dark and dangerous city all alone; but in his dreams he meets the legendary Jalal, who begins to teach him a secret long-lost martial art known only to cats: the Way. The myths come to life, and teach him how to live. 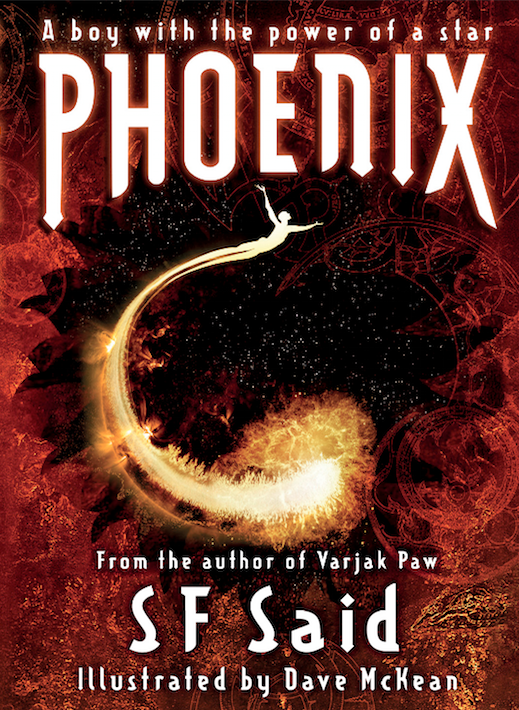 Phoenix is an epic myth set in space, where humans and aliens are fighting an apocalyptic war. A human boy who loves the stars makes friends with an alien girl, and together they discover that the stars are dying. The aliens believe the stars are alive, and can even come down from the sky to walk among us from time to time. When they do, people are dazzled by them and call them gods and goddesses, but what they really are is stars. They've come again and again through history, and these stars – known as the Twelve Astraeus – are the origins of all the ancient pantheons. They were called different things in different times and places, but all cultures have known them. 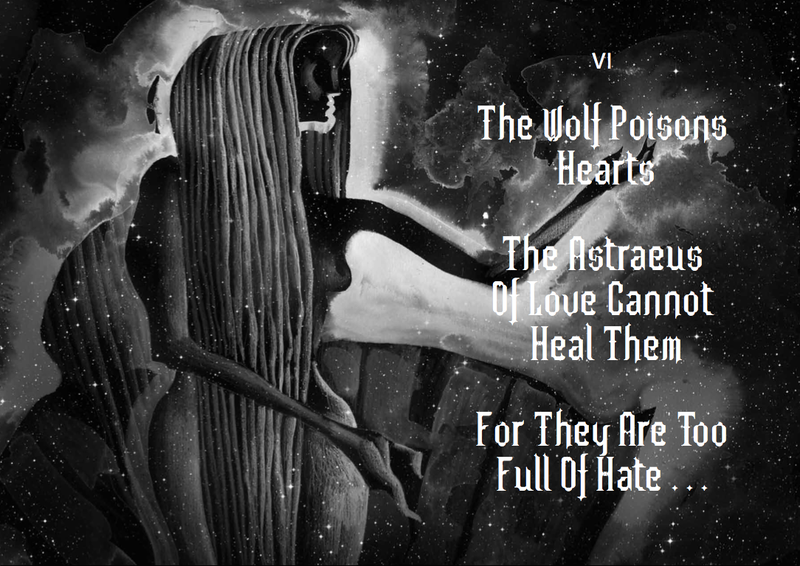 Above is Dave McKean's beautiful illustration of the Astraeus of Love. She's the origin of all the myths of Venus, Aphrodite, Ishtar and so on. Below is the Astraeus of the Sea, who has been known as Poseidon, Neptune, Njord, Apsu, Tiamat... So in Phoenix, we go back to the origins of all mythology, to try and find out what it really means. While I was writing Phoenix, I was beginning to read William Blake again, and to look at his later, more complicated poems. And I discovered that so many of the stories and writers I loved had been inspired by him. Because he was one of the first to take ancient mythologies and make something new from them, something that spoke to his own times and the things he cared about. Blake loved mythical, mystical systems of knowledge. A lot of people did in the 18th century; it was a time when people became interested in unexplained mysteries like Stonehenge and the Druids, and the lost continent of Atlantis. Many ancient myths were being unearthed and published for the first time – Icelandic, Germanic, Gaelic myths. For the first time, they were seen as expressions of deep truths; not silly stories told by primitive people, but ways of making sense of human experience, dealing with the mysteries of life, and those big questions I mentioned earlier. At the same time, Blake was passionately engaged with the politics of his day, with huge earth-shaking events like the French and American Revolutions. And he was living through massive changes in the texture of everyday life. 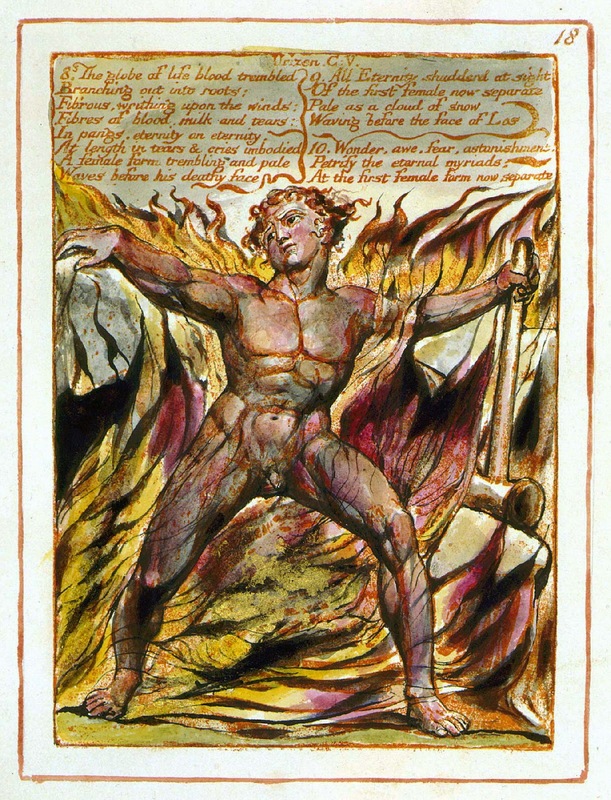 The 18th century saw the beginnings of industrialisation, mechanisation, mass production; the rise of science and rationality over all things; and some people including Blake felt in response a hunger for the spiritual, the mysterious, the mythic. 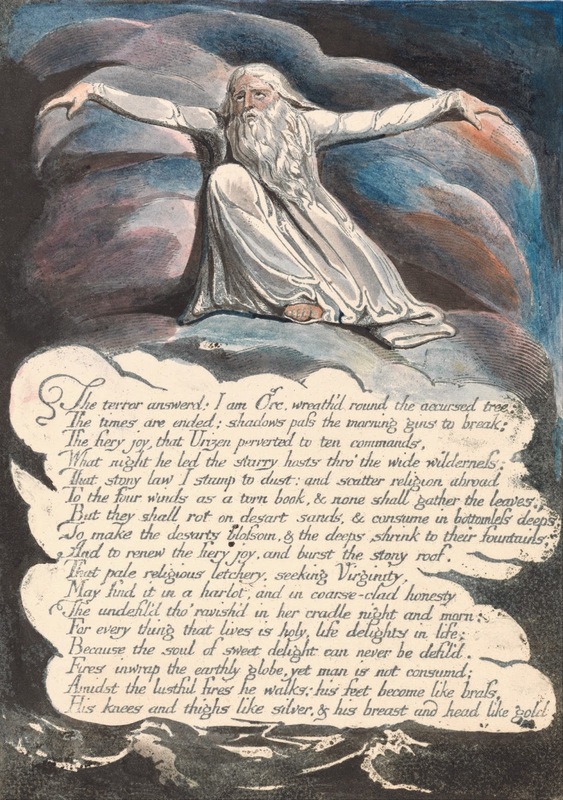 In his own time, he was largely ignored, but as those changes went further in the 19th century, Blake was rediscovered by Rosetti and pre-Raphaelite artists, and Yeats and mystical poets. Through the 20th century, his work became more and more relevant; and now in the digital age his reputation is bigger than ever. 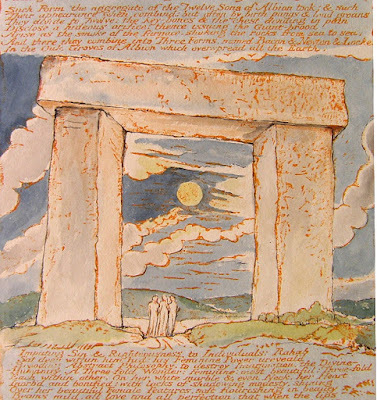 Blake explored all of these things through a mythology that he created, which he expressed in poetry and art of incredible intensity and beauty. I should say in all honesty: this is not easy stuff. The first time I tried to read it, I didn't get very far! But if you have patience and stick with it, keep looking at the pictures as well as the words – you do begin to enter a highly charged mythic space that is phenomenally rich and rewarding. It doesn't all make sense or tie up neatly; this is poetry and pictures, after all. But I'm going to try and talk you through some of it, to help you make sense of it, and maybe begin thinking about how you might go about making your own mythology – because I think that's something everyone can do. If you're interested in mythology, there's a famous 20th century scholar called Joseph Campbell who analysed it in books like The Hero With A Thousand Faces. He identified many elements that are common to all mythologies, because every culture has versions of the same myths, the same stories, the same characters. But Campbell wasn't the first to notice this. 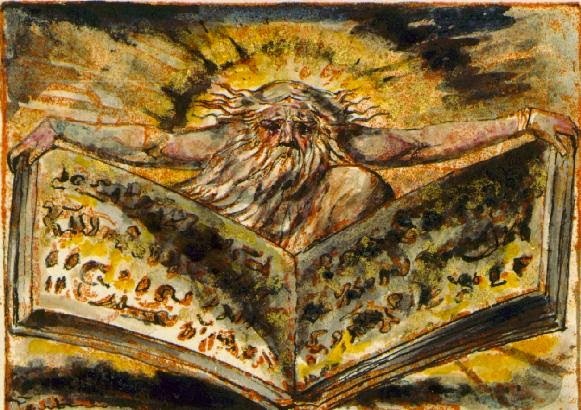 William Blake was very aware of it, and he in turn was inspired by a writer called Jacob Bryant. His 1774 book 'A New System, Or an Analysis of Ancient Mythology' was perhaps the first cross-cultural comparative mythology. 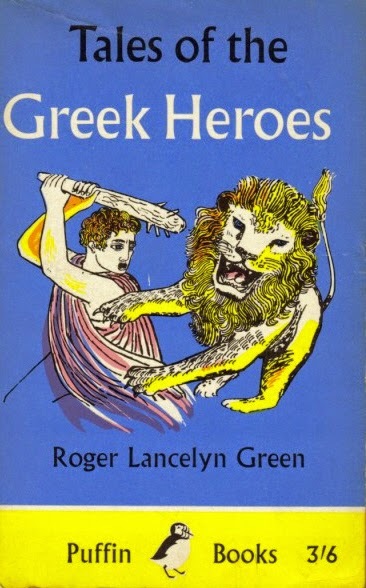 Bryant argued that the Bible stories and Greek myths were inherited from an even earlier original. He believed that these stories came from a race of giants dispersed across the world, and that they were the fragments of an ancient and forgotten faith. What Blake wanted to do was to recover this lost original, through his own mythology, which drew on all the systems he knew: the Greek myths of Hesiod's Theogeny, the Roman myths of Ovid's Metamorphoses, Norse, Germanic & British myths – and of course the Bible. Blake's own mythology begins to emerge in a poem called America: A Prophecy (1793), in which he writes about the American Revolution through his own set of mythic characters. 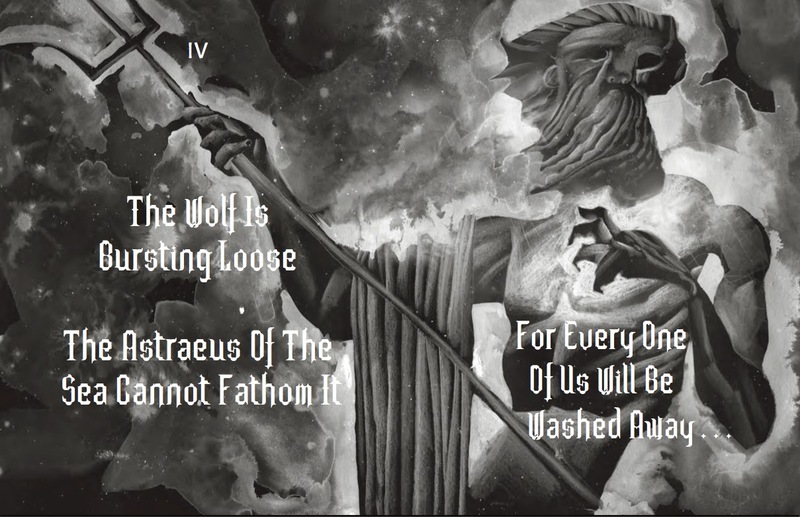 The poem has historical figures like George III and George Washington, but behind them, there are giant mythic antagonists, who go by the names of Urizen and Orc. They represent spiritual and psychological states. Urizen stands for repressive rationality, while Orc stands for rebellious energy. He's the one who inspires Washington, Jefferson and Franklin to declare independence; he's the true revolutionary spirit. It's a bit like Homer's Iliad, where we see the Trojan War heroes, but behind the scenes, we also see how they're manipulated by the gods. Blake then went much further in The Books of Urizen, Ahania and Los – all written in Lambeth in the last years of the 18th century. These books make up his so-called 'Bible Of Hell', in which he wrote his own versions of The Books of Genesis and Exodus. Just think about that for a moment: someone deciding to rewrite the Bible – in the 18th century. And that's not all; he also decided to rewrite science, and threw in a whole new theory of human perception and origins too! The central idea is very simple, but very revolutionary. 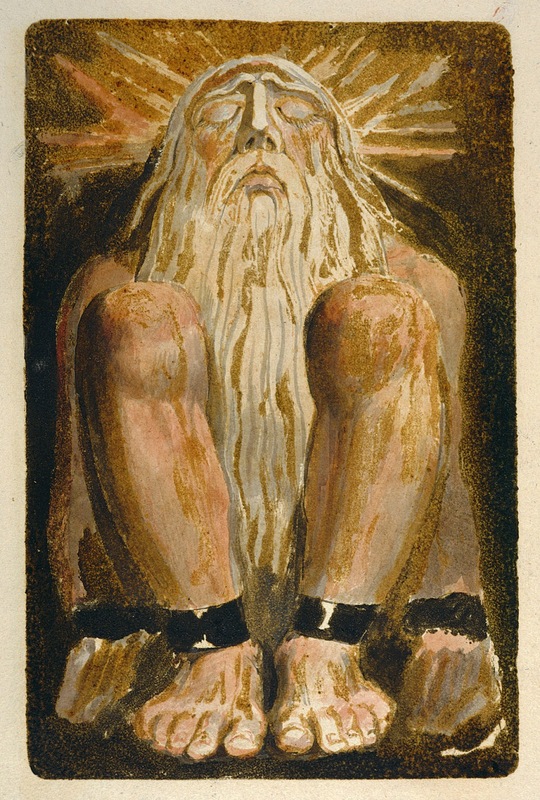 Blake believes that the material world is really a prison, and a mistake. All of matter is just spirit that's been trapped. The story in these poems is how that happened. This idea isn't original to Blake; it has roots in the Jewish mystical tradition of the Kabbalah and the Gnostic Christian tradition. But the way that Blake explores it, through the characters and images of his mythology, is absolutely his own. In his rewriting of Genesis, in his Creation myth, the world is not made from nothing; it's actually a mistakenly limited perception of the infinity of all being. 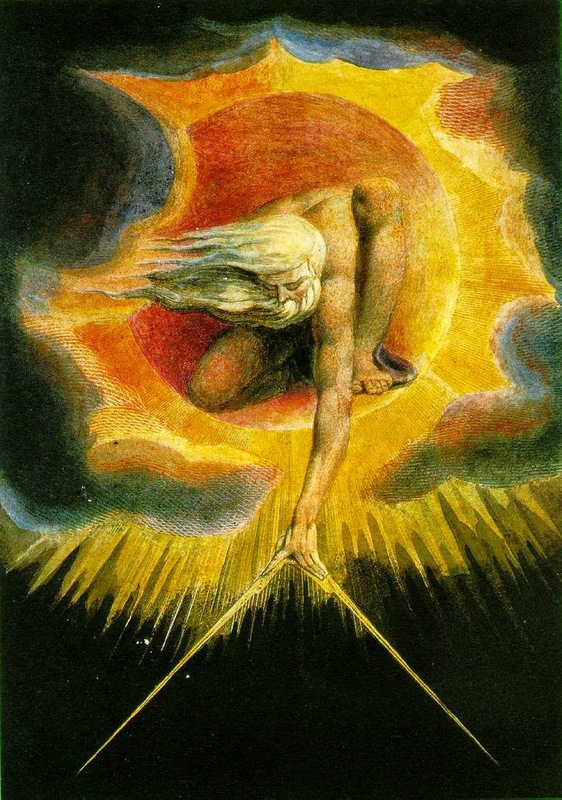 Urizen, the main character, starts out as one of the Eternals, connected with everything, and part of infinity; but then he decides he wants to be a separate being. That's the big mistake that starts everything off. Remember that Urizen stands for rationality – so this is rationality deciding it's separate from everything else that makes us human. Urizen begins to divide up reality. There he is above, with his compasses, measuring and limiting it. 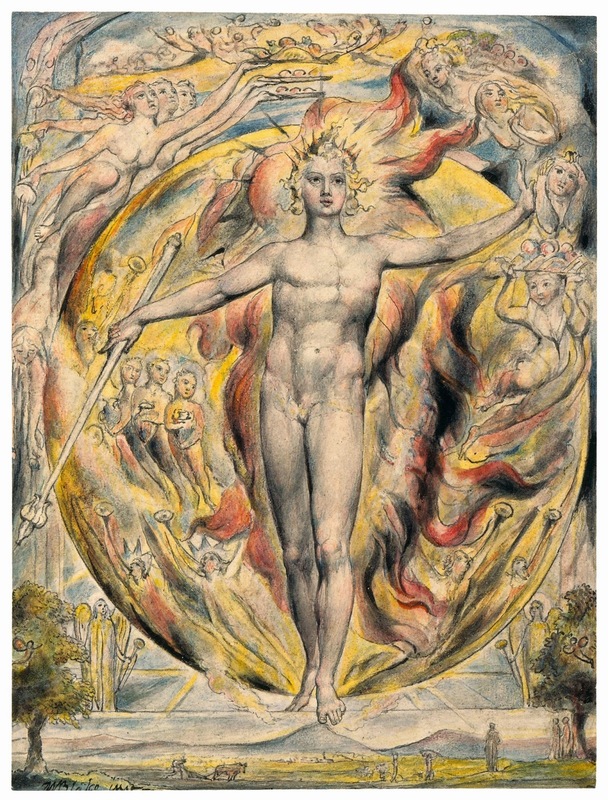 This is such a famous image, and people tend to see it as God creating the world – but to Blake, this is a spirit making a catastrophic error which leads to its own downfall, and to all the separations that we live with: self from other, subject from object, mind from matter, moral from immoral, finite from infinite, time from eternity, and so on. These are incredibly huge dramas. The events are elemental and primal. The forms are gigantic and heroic. You can see it in the artwork. It's not exactly realist. Peter Ackroyd has compared it to modern science fantasy comics and genre fiction. 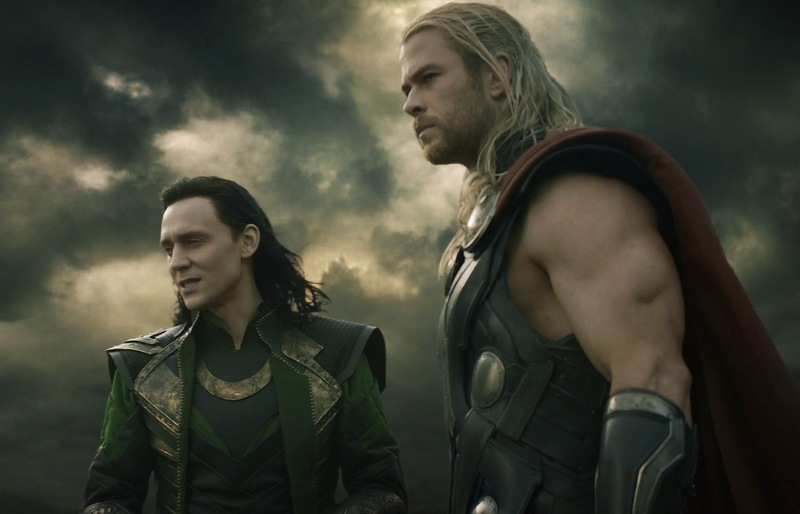 Think about, say, Marvel Comics and films: Thor and Loki in The Avengers. It's a bit like that. Blake gives us superhuman heroes and gigantic villains, with fantastic weapons. Fuzon uses a huge thunder-stone that lengthens into a kind of laser beam; Urizen has a bow made of a gigantic dead serpent's ribs. It's amazing stuff, and if you're interested in making your own mythology – as I am – it's endlessly inspiring. In fact, I can tell you that the working title of the new book that I'm writing right now is actually… TYGER! I can't say very much about it, because it's early days yet and my books change a lot as I work on them. But I can tell you that there's a huge Blake influence in this book; there's an entire new mythology; and, of course, there is a TYGER! So I'm going to leave you back where we began: with William Blake's amazing poem, The Tyger. Really interesting blog post, SF - with so much packed in! And all fascinating stuff, saving the rest of us having to plough through a load of weighty tomes (unless of course we feel like it!) Particularly impressed by the 4 minute video of the Hero's Journey, which took me AGES to read...thanks for sharing. Thank you so much for the great comment! I'm glad you enjoyed the blog; it was nice to be able to gather all my material for the Ashmolean talk in one place, and have a record of it. A good thing to do is have two versions side by side – one with the poems clearly printed, one with the illustrations – so you can go back & forth. The poems on their own don't have the immersive depth, while the text in the illustrated books is hard to read; but both together – wow! I also noticed that many of the ancient myths and culture are very similar. We have the basic theory of myth, where - God of Thunder is struggling with a dragon. This story is, in almost all cultures: Baal and Lotan, Torus, and the world of snakes, Perun and snakes, etc. We also have a lot of theory and mystics such as Daniel Andreev, who believe that everything that happens in our world, someone manages angels or demons. I would like more posts about what inspires you. Sounds like a fantastic talk, shame it wasn't recorded for you to post ... still, a brilliant synopsis here. Do love: 'I love the idea that myths might be true in some deep way; that they might express something timeless about the eternal questions of our lives.' Beautiful quote! Think you mean true in the sense that they actually happened here? But I do think that, in another sense, they are true - they share the archetypes and scenarios that we all have in our lives and can recognise in one form or another. I think that's why they're so magical - they frame our own experiences by breaking them down into the elements, then impose pattern and structure on those elements - how they are the same and different, how they are connected and separate - they help us break down our own human experience at an individual and societal level providing reference points for us to measure our own lives by, but set this to a magical backdrop that makes them timeless - and give a downright good story to tell in the bargain! Thanks so much for leaving me such a thoughtful comment! I didn't mean so much that mythic events might have actually happened; more that they express deep symbolic truths. I like what you say about archetypes and how myths helps us think about our own experiences and lives. I hope you enjoy reading the books; Phoenix is the most overtly mythic, but I think the mythic runs through everything I do. And no excuses are needed – I think of them as books for everyone, so you're totally allowed to read them too! Daniil Andreev, a Russian mystic. My, this is good, SF. Thank you for summarising so helpfully. I had the great pleasure to help with fundraising to save Blake's house at Felpham and so feel much more connected with his work. There's something wondrous about creating mythologies. Thank you for visiting my school recently, Mercenfeld Primary School, Markfield, Leics. 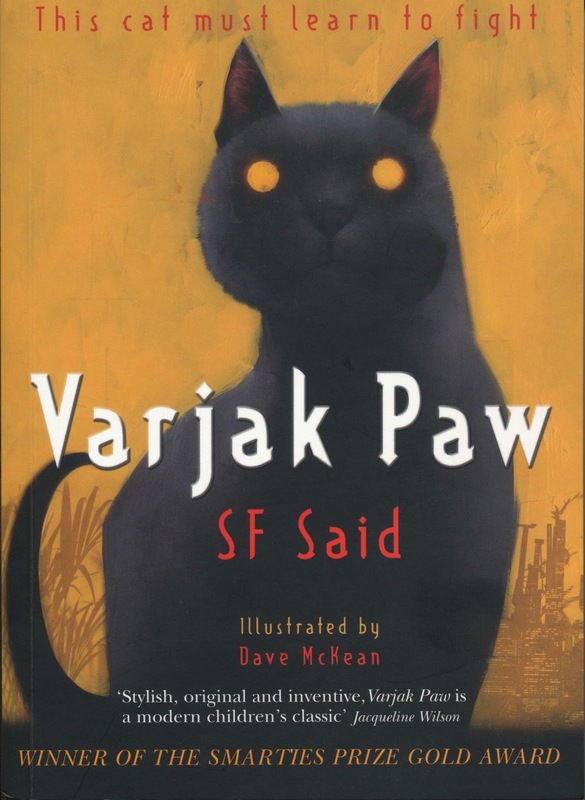 I enjoy the Varjak Paw and Phoenix books. It is world book day Thursday and I am wearing a cat costume! Thank you so much for your lovely comment! I'm glad you're enjoying Varjak Paw and Phoenix. And it's great to hear that you're wearing a cat costume for World Book Day! Which cat are you going as?